Trust Total Charters, the leading provider of bus rentals in and around Detroit, to coordinate your upcoming trip from start to finish. We’re available all hours of the day to ensure you receive a quality motorcoach rental and our undivided attention throughout your booking process. Our rental representatives are happy to help you book transportation for your upcoming wedding, sports tournament, corporate event, school field trip, or other occasion. Call us any time at 313-264-0933 for your free consultation and quote! With access to hundreds of buses in and around Detroit, we can always transport your group quickly and efficiently. Travel with us across town, across Michigan, or even across the country. Whichever you choose, you’ll receive a modern, reliable charter bus or minibus that fully meets your needs. From school field trips to the Detroit Institute of Arts to wedding receptions at Roostertail, we’ll make any trip run smoothly. When you book a bus with Total Charters, you’ll receive the services of a professional and knowledgeable driver. They will handle the logistics like parking and navigation so you can focus on your event. To learn more about our bus services, call our rental representatives today at 313-264-0933. They’ll provide you with a personalized, no-obligation quote and will be more than happy to answer all of your questions! Whether you're just passing through or planning to stay for a few days, Detroit offers plenty of attractions that tourists of all ages can enjoy. From the Motown Museum to The Henry Ford, there are plenty of entertainment options to fill your itinerary. While you're here, don't worry about navigating public transportation or splitting your group into separate cars-- we'll pair you with a bus rental that's perfect for your group to guarantee smooth transportation to every stop you have planned. Book a bus to transport students to one of several local institutions of higher learning, including Wayne State University and Marygrove College. We make it easy to tour colleges with personalized minibus rentals, allowing future students to explore campus from the comfort of a private bus. Your driver will make sure you're able to explore each campus's best spots before you make your final decision. Headed out to a field trip? 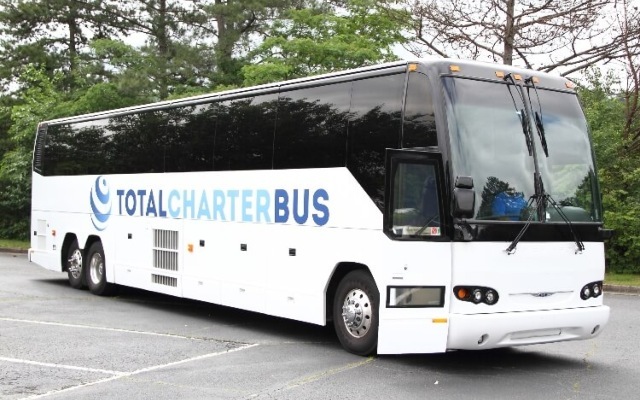 Book a charter bus and enjoy modern amenities such as air temperature controls, on-board restrooms, and entertainment options to keep all students and chaperones comfortable. You can enjoy the ride to local museums, parks, and other learning opportunities while you driver transports you safely to your destination. If you want to take your activities beyond Detroit, let Total Charters be your group transportation provider to nearby Midwestern locations. We service several major cities and attractions in the area. Visit Chicago, Indianapolis, Minneapolis, St. Louis, Bloomington, Louisville, or Lexington with ease in a personal bus rental. Detroit has a storied history in sports, and remains a popular destination for professional and ameteur sports activity. Fans can enjoy the competition by booking a private coach to get them to and from games, whether they’re headed see the Pistons, the Lions, or the Tigers. If you love to tailgate, you can even pack your grill, coolers, food, and beverages in one of the oversized luggage bays and enjoy private driver services when you book your game-day transportation with us. Professional and ameteur teams also enjoy the benefits of private coach transportation. Larger teams love the spaciousness and exclusive amenities a charter bus provides, while smaller teams enjoy the comfort and intimacy of a minibus. Coaches and training staff are also able to bring as many team supplies, uniforms, and training supplies as they need. Concerned about storage space or other amenities? Talk to our reservation specialists to help us find the perfect bus accommodations for you. For private events taking place in Detroit, look no further than Total Charters. We offer a number of services that benefit corporate groups, weddings, private parties, and social gatherings, such as airport transfers and personalized shuttle services. Connect separate event venues with a minibus that will run on your schedule and service your group exclusively; or, bring in everyone from out of town with a reliable charter bus outfitted with comfortable amenities to ensure an enjoyable trip. Total Charters is prepared to give you the best transportation services in Detroit. Our dedicated reservation specialists are available 24/7 at 313-264-0933 to help you plan the perfect transportation for your trip. Contact us today to receive a free, no-obligation quote!